I honestly didn’t expect the 40 Piece Challenge to go global the way it has quite as rapidly as it has. This backstory post was supposed to get written in plenty of time for anyone interested, and I know I’ve already missed that window. Once upon a time I was a teacher in Australia teaching my students the way teachers in exam-oriented and competition-oriented culture have always taught – spending between 4 and 9 months working with students on their exam/competition repertoire (the 4 month kids were doing two exams/competitions each year rather than one) and then having a few months per year for “fun” pieces that weren’t “for” anything. Students working this way would be learning between 6 and 10 pieces a year total, as a rule. The more students progressed in degrees of difficulty the more their sight-reading skills lagged behind. And at the end of about 10 years of serious study throughout their childhood the students would cease lessons with a slew of certificates and awards and probably never really play very much again. The students who could play quite well by ear tended to be the ones who kept on playing after formal lessons stopped. And that struck me as signalling that there was something very wrong, possibly even unethical, with the way I was teaching. Shouldn’t 10 years of serious study equip you for a lifetime of engagement with your instrument? In the year 2001 I was doing a series of workshops around Australia on technique for beginners. I was asked to give this series of presentations and I felt as if I really wasn’t the most qualified on the subject, so I began reading all kinds of treatises and manuals and histories and pamphlets. One three page article at the front of an etudes collection really struck a chord with me. It said something along the lines of “how on earth can students be expected to gain a wide variety of skills, let alone an understanding of musical thinking and pianistic style, if they only ever learn 6 pieces each year? Our students should be learning many times this number, 40 or so at least each year, if they are to have any hope of truly mastering the instrument”. Gosh, I thought, this guy could be talking about me! This is MY students he’s referring to! He really knows what it’s like to be a teacher in Australia at the start of the new millennium. Now I have no idea where I read this – it’s somewhere in my vast library – but the salient element here is that when I got to the end of the article I realised this guy wasn’t talking about me at all, or musical life in Australia. The article was written in the mid-1800s, in the middle of Europe. Right, I thought. So this has been going for literally ages. Time to take this guy seriously. “You do that”, replied the encouraging but sceptical teachers. Well, it wasn’t easy, I can tell you that. My students weren’t overly impressed that I was asking them to learn double, triple, quadruple the number of pieces they learned the year before. Why?, they would implore. I’d explain the logic and they’d smile and nod, and they liked me, most of them, so they did their best. Part of the trouble was where to find the vast quantities of repertoire the students were going to need. Christopher Norton’s Microjazz books seemed like an instant no-brainer inclusion – the kids loved so many of his pieces, and the collections were amply laden with repertoire. Learning extra pieces from exam books was equally obvious – so long as there were sufficient pieces the students would want to learn. In 2002 I pitched an idea to Hal Leonard Australia. How about we produce a repertoire series that matched up with the Australian Music Examination Board and the Trinity College exams and the ABRSM exams and the other local exam boards operating in Australia (ANZCA, for example), and presented 30 graded pieces at each grade level in a logical learning sequence, including plenty of works written in the 20th century. Teachers have so much trouble sourcing these pieces – and it’s vital for students to play the music of their own time. By the time I was presenting the professional development seminars that launched this repertoire series I had about 30 months experience implementing my new repertoire-rich teaching regime, and so I could report from the trenches just how it was working out. It was working out just like the guy in the mid-1800s had said it would. Students were sight-reading ridiculously well. Their initiative to source new pieces to learn had gone through the roof. The volume of pieces wasn’t slowly down their capacity to progress onto more difficult work. And when they did progress onto more difficult work they had this growing stylistic awareness that is the fruit of much experience. It was amazing! On the other hand, I’d had some dodgy moments along the way as well. Students who resisted the repertoire I was assigning. Repertoire that was getting bogged down over time. But I was paying attention and learning from my mistakes. One of the big lessons I had learned was that I needed to compete with the external assessment values of the exam systems. The students needed to feel as if learning each and every piece was actually important, the same way they felt about their examination repertoire. I began the 100 Piece Medal. When students had learned 100 pieces they received a medal at the end of year recital. Beginners could manage this in their very first year if they worked really hard! Older students became motivated to learn easier pieces so they could reach the arbitrary target of 100 pieces sooner – and best of all, every time I assigned a new piece students would be excited and leave their lessons telling parents “I got three new pieces today!! !” all aglow because they were getting closer to the medal. In 2004 we took the 100 Piece Medal studio-wide. I’d been teaching with my mother, Anita, and my sister, Suzanne, through the 1990s, and we had a massive studio when taken as a whole. By 2004 Suzanne was in London, so we were back to a studio of about 70-80 students (still plenty) who by this stage had had at least a year of two of learning in a repertoire-rich fashion. In the professional development seminars I was giving around Australia and New Zealand (and in Malaysia in 2006) I kept talking about teaching roughly a piece a week (the origin of the 40 Piece Challenge number – there being roughly 40 teaching weeks in the Australian school year) in order for students to be developing all-round keyboard musicianship and knowledge. In 2009 I started this blog, and very soon began writing about the principles involved in teaching students to be learning a wide variety of repertoire right from the beginning, what it meant to learn a piece this way, and discussing the benefits this approach brings. In January 2010 I did a tour with Samantha Coates of Blitzbooks fame and with Abe Cytrynowski, of ScaleCards fame (both Sam and Abe are the brains behind the amazing ScaleBlitzer app), and my part of the day long seminar was to talk about this idea of a repertoire-rich approach to teaching. By this stage there were teachers present who could testify to the impact of teaching LOTS of pieces each year to their students, and by this stage I couldn’t ever imagine going back to the way I’d taught before and the repertoire-rich teachers agreed: how tedious that would be! Sam went on to implement a 50 Piece Challenge in her studio in 2011 and wrote about it here. In January 2011 I did a tour with Gayle Kowalchyk and Dan Coates, a series of day-long seminars organised by Alfred. My job was to be the MC and – you guessed it – to talk about repertoire-rich teaching and learning. A whole new teaching crowd came along to these seminars. Teachers who’d never heard me talk about this approach before. One of them quizzed me hard on the day he attended in Melbourne, and a year later he wrote this blog post. I was writing some articles for Piano Teacher Magazine, and the editor, Gina Wake, and I discussed the magazine backing this repertoire-rich approach, and next thing the 40 Piece Challenge was born. And that’s all it was – a challenge to teachers to change their teaching, to commit to not being limited to one set of exam pieces and a couple of Christmas carols each year. No rewards or prizes. Just a challenge. Then I was at NCKP in July 2013, and had a fabulous dinner with some of North America’s most fabulous piano pedagogy writers: Diane Hidy, Forrest Kinney and Wendy Stevens. I told my dinner companions about the 40 Piece Challenge. Cool idea, they all said, and Wendy said, hmm, I’d like to do a 30 Piece Challenge with my students this year… She blogged about it and instantly the 40 Piece Challenge had gone global, albeit with a numeral change. By the time September 2014 rolled around the Northern Hemisphere was gearing up for its second year of 40/30 Piece Challenges, and teachers were blogging about their experiences over the previous academic year. This mid-19th century idea had gone full 21st century. So here we are. February 2015. There are now students who began learning this way, who have no idea what it might be like to only learn 10, 8, 5 pieces a year, who are old enough and advanced enough to begin teaching students of their own. It’s global, and it’s now generational. And this is the story of how the 40 Piece Challenge began. 100 Piece Medal, 30 Piece Challenge, 40 Piece Challenge, Abe Cytrynowski, BlitzBooks, Dan Coates, Diane Hidy, Elissa Milne, Forrest Kinney, Gayle Kowalchyk, Gina Wake, Hal Leonard Australia, how did the 40 Piece Challenge begin?, NCKP, Piano Teacher Magazine, repertoire-rich learning, repertoire-rich teaching, Samantha Coates, the Getting to series, Tim Topham, Wendy Stevens, where did the 40 Piece Challenge begin? 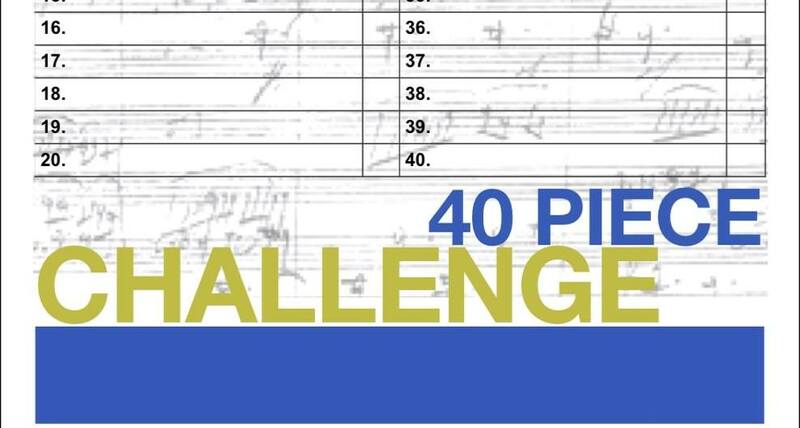 There is a busy forum post discussing this 40 piece challenge on piano world. Bringing a breadth of experience to one’s playing is the ONLY way to be able to play with depth – the more music we have in our fingers/bodies/lives the more the music we make becomes a conversation, not just with our listeners but also with all the music we’ve been a part of before. I’ll come and read the thread from time to time and see how it’s working out for everyone! And I MUST get my Piano World Forum password woes sorted once and for all – for some reason every time I’ve tried to log on since 2013 I’m forced to ask for a temporary password, and whatever new password I set doesn’t seem to take. Which has rather discouraged me from logging in!!! Thank you so much for taking the time to let me know about this – very cool, indeed. My students are doing the 40 piece challenge to improve their sight reading and become independent learners. They each have a Piano Home Reader folder . They borrow a book of simple pieces from my collection and teach themselves one or more per week. Some students download pieces from the web and surprise me with their achievements. I compare it to their school home reader routine: the more variety they read the more their confidence grows. My daughter and I are doing the 40 piece challenge although I don’t use that expression when talking about it with her because the word challenge would make her fall in a heap and afterall, its not much of a challenge! For some time she’s been doing the Hal Leonard Piano course with a dozen a day on the side. When she got bogged down at around zum zum gali I suggested she start Getting to Preliminary (which starts off easier than zum zum gali). Then I made playlist of all the AMEB preliminary recordings on spotify and she fell in love wiht Goblin March, so now she has four books! She’ll need more. The teacher is rather bemused at so many books but his policy is “don’t get bogged down, learn the lesson and move on”. So we were very lucky to get a match of ideology there! She declares that three pieces + some dozens (we call them hopping and bopping) is just right for a 25min practice session. She’s also rather smug that she’s not studying for exams, which has nothing to do with music, she’s learning to play for the fun of it, just like you learn to read so you can read Harry Potter. Her attitude to practice is really productive. She takes a more adult approach to it, and spends less and less time just playing through the pieces. So one more success story here! Well two actually because I spent last year doing 5th grade pieces intersperse with 2nd grade rocket pieces and the feedback I get from listeners is very satisfying. Absolutely fantastic feedback!! So excited to know that this is making for happy musicians, students, teachers and families!!! Did you know Graham Fitch at Practising the Piano has a similar philosophy? To redress the balance between the type of painstaking and time-consuming practise involved in perfecting a piece and the ability to read well and learn fast, I am a great believer in quick studies. Learning a piece from scratch involves different skills and different parts of the brain from playing pieces we already know. If we are constantly keeping these particular grey cells active, they get faster and stronger and this makes processing new material quicker and easier. This is where quick studies come in. Love, love, love that article of Graham’s from 2013… Yes, we are both working inside the same culture, and the only musical way to a better place is for more music to be happening! Of course, it’s more than just “quick studies” – it’s about being open to new music all the time, and having a range of strategies available to meet different kinds of real world challenges. The 40 Piece Challenge has one other very important goal as well: exposure to as wide a range of pianisms as possible. If students are only learning 3, 4, 5 pieces a year, they are not getting the opportunity to ‘meet’ a lot of different musical thinkers, or to ‘hear’ in their fingers a wide range of musical voices… By playing more music the student brings more context to each new act of performance and to each new piece they learn to play…. True and exposure to multiple “pianisms” probably has three (at least) benefits. The first is as you say, you’re meeting so many more ideas and voices, building up a library of motifs. But also, by playing a lot of easy pieces you can focus on those new ideas, or on those three odd, and therefore hard, bars without the overhead of the struggling with the bleeding edge of your technical abiity. But possibly most importantly, its the bean bag effect. A study where kids were asked in one group to throw bean bags into a bucket from 3 feet, while a second group practised from 2 and 4 feet, but not three feet, then tested all kids from the 3 foot mark and low and behold, the ones that practised from 2 and 4 feet were better at throwing from 3 feet than the ones who had only practised that particular skill. By practising the same skill (piano) in many slightly different contexts (pieces) the skill becomes more robust, while practising the same thing over and over gives the illusion of mastery until something changes such as moving from the home piano to the exam room. Thanks for this! I think as teachers it’s so easy to get focused on the more difficult, impressive songs, and neglect the benefits of learning A LOT of music quickly. Thanks for this reminder! chibitravel is me, Samantha, BTW! This is hardly a new idea…..piano masters such as Czerny did all this already. That is why he wrote single books with dozens of studies each. He did not write them just to develop some ovbious techniques in the students, like staccato or legato. He wrote them so that they would develop sight reading skills. The problem is this: the “amateur” of the 1800’s was not the lazy amateur of today. Probably “the guy” you mentioned knew all this only too well? As to the purpose of Czerny writing so many studies – I think you maybe have a not-quite-cynical-enough perspective of print music publishing! Writing new collections meant new sales, and new sales meant more income. Print music was a terribly lucrative enterprise for a writer of learning materials such as Czerny’s. It would be naive, to say the least, to ascribe the prodigious output of etudes simply to Czerny’s commitment to a repertoire-rich learning experience for students! And a genuinely repertoire-rich musical life is not one of learning hundreds of pieces by the same composer. Ideally a young pianist will experience the sound worlds of hundreds of other musical minds, rather than focussing on the collections of a handful of composers. As to the amateur of the 1800s – indeed, the expectations of the piano student were extreme by today’s standards, and it was not uncommon for students to have multiple lengthy lessons each week. But in this post I am not talking about amateur pianists, I am discussing children who are learning to play the piano. And yes, there is a difference between a child-student and an “amateur”!